The King was later executed for failure to protect the welfare of his subjects.‭ In the‭ ‬1760‭'‬s and‭ ‬70‭'‬s,‭ ‬the American Rebels embraced this tradition.‭ ‬Thomas Jefferson adopted as his own motto a saying,‭ ‬which he attributed to Judge John Bradshawe:‭ "‬Rebellion to tyrants is obedience to God.‭"
This page begins with a mystery – what is the connection between a little known town in Cheshire, an even lesser well-known parish in Jamaica and the ashes of the one and only President of the one and only Republic of Great Britain whose memory the State, Church and the Monarchy took great pains to erase? WARNING - this page goes on forever, so - make yourself comfy with a cuppa. Stockport was first‭ ‘‬wiped off the map‭’ ‬by the‭ ‬Normans as they moved northwards,‭ ‬following their invasion and conquest of‭ ‬Britain in‭ ‬1066.‭ ‬They obviously considered it to be a threat.‭ As a result of this,‭ ‬Stockport’s first claim to fame is that,‭ ‬as a result of this erasure and,‭ ‬unlike Wythenshawe/Northenden,‭ ‬it is not mentioned in the Domesday Book. It was again wiped off the political map in the latter part of the‭ ‬17th Century in a State-sponsored effort to erase a monumental chapter of world history. Stockport is also the birthplace of someone that both the Crown and Parliament preferred to forget,‭ ‬someone who helped author the democratic rights that we all take for granted today. His name was John Bradshawe,‭ ‬known as Judge John Bradshawe,‭ ‬who went on to become the Lord President of the High Court of Justice which condemned King Charles‭ ‬1st to death. In February‭ ‬1649‭ ‬he was made President of the Council of State‭ (‬the‭ ‬English‭ ‬Republic‭)‬,‭ ‬the highest office in the kingdom.‭ ‬In March of the same year he was appointed Chief Justice of Wales and in July he was re-appointed Chief Justice of Chester.‭ ‬During this time he also presided over the newly constituted Court for the trial of political offenders.‭ ‬Shortly after he was made Chancellor of the Duchy of Lancaster,‭ ‬an appointment that was renewed by Act of Parliament each year,‭ ‬and an office he held until February‭ ‬1656. "‬He brought to the study of the law,‭ ‬a capacity enlightened,‭ ‬a lofty spirit and spotless manners obnoxious to none,‭ ‬so that he filled the high and lofty office,‭ ‬rendered the more dangerous by the threats and daggers of private assassins,‭ ‬with a firmness,‭ ‬a gravity,‭ ‬a dignity and presence of mind,‭ ‬as if he had been designed and created by the Deity expressly for this work,‭ ‬for how much more is it just and majestic to try a tyrant than to slay him untried‭?" John Bradshawe was probably born at‭ '‬The Place‭'‬,‭ ‬later known as Peace Farm,‭ ‬which was located on the site of the Texaco garage,‭ ‬at the corner of‭ ‬Stockport Road and‭ ‬Church Lane in‭ ‬Stockport.‭ ‬Wybersley Hall has also been cited as Bradshawe's birthplace and this is an argument that can never be firmly resolved,‭ ‬as there are no definitive records‭ (‬the monarchy made sure of that out after the Restoration‭)‬. His baptism was entered in the Stockport Parish Register on‭ ‬the‭ ‬10th December‭ ‬1602.‭ ‬At some later date the word‭ "‬Traitor‭" ‬was added in a different hand. Very little has been known up until recently about John Bradshawe.‭ ‬After the Restoration of Charles II,‭ ‬Bradshawe's body,‭ ‬along with those of several others,‭ ‬was exhumed from Westminster Abbey by order of the Council of State and on‭ ‬the‭ ‬30th January‭ ‬1661,‭ ‬the anniversary of the execution of Charles I,‭ ‬the bodies of Cromwell,‭ ‬Ireton and Bradshawe were hung on the gallows at Tyburn.‭ Their heads were afterwards cut off and set up in Westminster Hall and their bodies burned and thrown into a hole dug under the gallows.‭ ‬It is said that the heads of Cromwell and Bradshawe were still fixed on the spikes of‭ ‬Westminster in‭ ‬1684,‭ ‬when that of another traitor was placed between them.‭ ‬The State took great pains to destroy any trace of,‭ ‬or reference to,‭ ‬the life and achievements of John Bradshawe. Bradshawe himself did not attend court until the third session after his appointment,‭ ‬apologising on the grounds that he had been out of‭ ‬London and disavowed his ability to perform‭ “‬so important a task.‭” ‬While he served as the Lord President,‭ ‬he was flanked by an impressive personal guard and carried a sword at his side.‭ ‬He wore scarlet robes and a‭ “‬broad-brimmed,‭ ‬bullet-proof iron hat,‭ ‬which he had covered over with velvet" (left). ‬King Charles refused to recognise the authority of the court and would not plead.‭ ‬After declaring Charles I guilty as a‭ “‬Tyrant,‭ ‬Traitor,‭ ‬Murderer,‭ ‬and a public enemy,‭” ‬Bradshaw did not allow the king any final words.‭ ‬Under English law,‭ ‬a condemned prisoner was no longer alive and therefore did not have the right to speak,‭ ‬and Bradshaw followed this tradition strictly. On‭ ‬12‭ ‬March,‭ ‬1649‭ ‬Bradshaw was elected President of the‭ ‬Council of State,‭ ‬which was to act as the Executive of the country's government in place of the King and the Privy Council.‭ ‬After wars in‭ ‬Scotland and‭ ‬Ireland the Long Parliament had still not dissolved itself or called for re-elections.On‭ ‬30‭ ‬April‭ ‬1653,‭ ‬Oliver Cromwell declared Parliament and the Council dissolved and soon assumed rule as‭ ‬Lord Protector calling elections for a new Parliament himself. Since‭ ‬1‭ ‬August,‭ ‬1649,‭ ‬Bradshaw had also held the post of‭ ‬Chancellor of the Duchy of Lancaster.‭ ‬After‭ ‬1653,‭ ‬he served as commissioner of the Duchy,‭ ‬jointly with Thomas Fell,‭ ‬until mounting differences with Cromwell culminated in this resignation in‭ ‬1654.‭ Bradshawe,‭ ‬though an ardent Republican,‭ ‬became an opponent of the Protectorate.‭ ‬After Oliver Cromwell died in‭ ‬1658,‭ ‬his son Richard succeeded him as Lord Protector and reinstated Bradshawe as Chancellor of the Duchy of Lancaster. 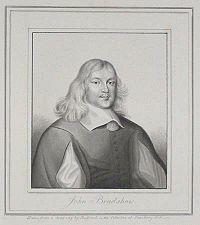 In‭ ‬1659,‭ ‬Bradshaw moved to‭ ‬Westminster after falling dangerously ill,‭ ‬and died on‭ ‬31‭ ‬October of the same year.‭ ‬He was buried with great honours at Westminster Abbey.‭ ‬On his deathbed Bradshaw averred that if called upon to try the King again he would be‭ "‬the first man in‭ ‬England to do it‭"‬. Charles II was restored to his throne in‭ ‬1660.‭ ‬On‭ ‬January‭ ‬30th,‭ ‬1661‭ ‬-‭ ‬the twelfth anniversary of the regicide‭ ‬-‭ ‬the bodies of Bradshaw,‭ ‬Cromwell and Henry Ireton were exhumed and displayed in chains all day on the gallows at Tyburn.‭ ‬At sunset the bodies were beheaded.‭ ‬The bodies were thrown into a common pit and the heads were displayed on pikes on top of Westminster Hall. 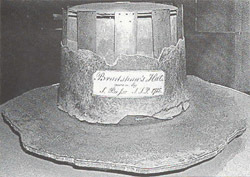 Bradshawe’s name and very existence was erased from British memory.‭ ‬It is only very recently that he was brought to the attention of pesent-day Members of Parliament.‭ ‬Some of his ashes and the remains of a bone from one of his fingers was secreted away by an unknown sympathiser to the Republican Cause. King James I actually wrote a treatise on the divine right of monarchs entitled‭ ‘‬The True Law of Free Monarchies‭’‬.‭ ‬More surprisingly,‭ ‬the theory of rule through heavenly appointment was generally accepted outside the circle of monarchs.‭ ‬In order to properly exercise the powers ordained by God,‭ ‬a monarch had to act in the best interests of his people‭ ‬-‭ ‬rule through good laws,‭ ‬pursue peace and prosperity.‭ ‬Kings who failed to rule according to divine dictates‭ ‬-‭ ‬whatever they were perceived to be‭ ‬-‭ ‬risked God's wrath.‭ ‬Kings became synonymous with the public performance of the duties of state,‭ ‬and all monarchs were constrained to appear in front of their subjects. James I elevated the Duke of Buckingham from the ranks of the commoners to the nobility of‭ ‬England.‭ ‬Buckingham's position as the royal favourite allowed him to gain influence within the royal government,‭ ‬particularly in the military.‭ ‬Buckingham survived the death of James I to become the royal favourite of Charles I. His continued role of influence and power within the royal court alienated many of the English nobility.‭ ‬When his foreign policy schemes failed,‭ ‬Parliament attempted to have him removed from the king's presence.‭ ‬The support of the monarch frustrated parliamentary attempts at impeachment,‭ ‬but a disgruntled naval officer assassinated Buckingham in‭ ‬1628. Absolutism involved reverence for the person of the monarch as the symbol of the state,‭ ‬the consequent diminution of other elites within the state,‭ ‬personal management of the government by the ruler,‭ ‬decline of influence of representative bodies,‭ ‬and growth of the military.‭ ‬Absolutism remained more theoretical than practical.‭ ‬It depended on a capable ruler,‭ ‬the absence of religious diversity,‭ ‬and the will of the governed to support the government. Despite the attempts of monarchs and personal favourites to increase the power of the central government,‭ ‬powerful regional elements existed within all the states of‭ ‬Western Europe.‭ ‬One of the primary means of achieving centralisation over the regions was the creation of strong central legal systems.‭ The local officials in‭ ‬England were called Lords Lieutenant.‭ ‬England,‭ ‬alone among European states,‭ ‬was without a standing national army.‭ ‬The function of the Lords Lieutenant was to raise,‭ ‬equip,‭ ‬and train a local militia on royal demand.‭ ‬However,‭ ‬English armies were not the most proficient in‭ ‬Europe. The expansion of the state occurred at the expense of other corporate entities‭ ‬-‭ ‬the Church,‭ ‬towns,‭ ‬and aristocracy.‭ ‬Often immune from taxation,‭ ‬the corporate bodies nevertheless relied on their own ability to mulct the peasantry.‭ ‬More efficient and intrusive legal systems disrupted the traditional patterns of local authority.‭ ‬At the same time,‭ ‬population pressure on the agricultural system led to failures in the food supply.‭ ‬Responses were violent.‭ ‬At first resistance was on a local level.‭ ‬By the‭ ‬1640s,‭ ‬the focus of resistance was the state itself and the concept of divine monarchy. 1707‭ ‬brought the Union of England with‭ ‬Scotland and the first Parliament of Great Britain.‭ ‬Growing pressure for reform of Parliament in the‭ ‬18th and‭ ‬19th centuries led to a series of Reform Acts which extended the vote to most men over‭ ‬21‭ ‬in‭ ‬1867‭ ‬and,‭ ‬finally,‭ ‬to women over‭ ‬21‭ ‬in‭ ‬1928.‭ The legislative primacy of the House of Commons over the Lords was confirmed in the‭ ‬20th century by the passing of the Parliament Acts of‭ ‬1911‭ ‬and‭ ‬1949. The Executive comprises the Government‭ (‬members of the Cabinet and other ministers responsible for policies‭)‬,‭ ‬government departments and agencies,‭ ‬local authorities,‭ ‬public corporations,‭ ‬independent regulatory bodies and certain other organisations subject to ministerial control.‭ ‬The judiciary determines common law and interprets statutes. Following devolution,‭ ‬the responsibilities of the Secretaries of State for‭ ‬Scotland,‭ ‬Wales and‭ ‬Northern Ireland changed considerably,‭ ‬although they retain their positions in the UK Cabinet.‭ ‬They ensure that the reserved interests of the countries they represent are properly considered in central government and they lead the presentation of government policy in their parts of the‭ ‬UK.‭ ‬They are also responsible for safeguarding and promoting the devolution settlements of their respective countries. The so-called Glorious Revolution of‭ ‬1688‭ ‬produced a new political theorist,‭ ‬John Locke.‭ ‬In Two Treatises on Civil Government,‭ ‬Locke proposed a social contract that existed between rulers and their subjects.‭ ‬In the contract,‭ ‬the governed gave up some of their unlimited natural rights to the ruler in order to secure greater liberty and freedom from violence.‭ ‬Monarchs who acted arbitrarily or failed to protect the rights of their subjects could be deposed. The king was able to gain the support of much of the English aristocracy.‭ ‬Parliament enjoyed the support of those who sought religious reform.‭ ‬By‭ ‬1645‭ ‬parliamentary forces gained a military advantage.‭ ‬Charles I,‭ ‬actually a prisoner of Parliament,‭ ‬refused to cooperate with his conquerors.‭ ‬In the face of royal intransigence,‭ ‬the uneasy coalition of opponents of the Crown began to disintegrate.‭ ‬Religious moderates and radicals created new political alignments. While there had been three earlier attempts to unite the two countries by Acts of Parliament,‭ ‬these were the first Acts which had the will of both political establishments behind them,‭ ‬albeit for rather different reasons.‭ ‬In the English case,‭ ‬the purpose was to establish the Royal succession along Protestant lines in the same manner as provided for by the English Act of Settlement rather than that of the Scottish Act of Security.‭ ‬In the Scottish case,‭ ‬the purpose was partly to use English subsidies to recover from the financial problems caused by the failure of the Darién scheme and partly to remove English trade sanctions put in place through the Alien Act to force the Scottish Parliament into compliance with the Act of Settlement. The Acts of Union were not universally popular in‭ ‬Scotland,‭ ‬particularly amongst the general population.‭ ‬Many petitions were sent to the Scottish Parliament against union,‭ ‬and there were massive protests in‭ ‬Edinburgh the day it was signed.‭ ‬Many historians have since argued that the Scots Parliamentarians were coerced into signing up for union by English bribery. The Act incorporated provisions for‭ ‬Scotland to send representative peers from the Peerage of Scotland to sit in the House of Lords.‭ ‬It guaranteed that the Church of Scotland would remain the established church in‭ ‬Scotland,‭ ‬and that the Court of Session would remain.‭ ‬It also established that the flag of‭ ‬Great Britain would be based on the Flag of England and Flag of Scotland‭; ‬the exact design of the Flag of Great Britain was adopted later. Other provisions included to restate the Act of Settlement and the ban on Roman Catholics from taking the throne.‭ ‬It created a customs union and monetary union. The treaty provided that if any‭ '‬laws and statutes‭' ‬were‭ '‬contrary to or inconsistent with the terms‭' ‬of the Treaty‭; ‬that they would be null and void.‭ ‬This has not been held to prevent the Parliament of the‭ ‬United Kingdom from amending the Act. The‭ ‬Kingdom of‭ ‬Great Britain merged with the‭ ‬Kingdom of‭ ‬Ireland to form the United Kingdom of Great Britain and‭ ‬Ireland on‭ ‬1‭ ‬January‭ ‬1801,‭ ‬through the Act of Union‭ ‬1800.‭ ‬The‭ ‬United Kingdom shrank a little in‭ ‬1922‭ ‬when most of‭ ‬Ireland left to become the‭ ‬Irish Free State. The‭ ‬1800‭ ‬Act of Union merged the‭ ‬Kingdom of‭ ‬Ireland and the‭ ‬Kingdom of‭ ‬Great Britain‭ (‬itself a merger of‭ ‬England and‭ ‬Scotland under the Act of Union‭ ‬1707‭) ‬to create the United Kingdom of Great Britain and‭ ‬Ireland on‭ ‬1‭ ‬January‭ ‬1801. Under the terms of the union,‭ ‬Ireland continued to have over‭ ‬100‭ ‬MPs representing it in the united parliament,‭ ‬meeting in the‭ ‬Palace of‭ ‬Westminster.‭ ‬Part of the trade-off was to be the granting of Catholic Emancipation.‭ ‬However this was blocked by King George III who argued that emancipating Roman Catholics would breach his Coronation Oath‭; ‬it instead happened in‭ ‬1829. The flag created by the merger of the Kingdoms of Great Britain and‭ ‬Ireland in‭ ‬1801‭ ‬still remains the flag of the current‭ ‬United Kingdom.‭ ‬Known as the Union Jack or the Union Flag,‭ ‬it combines the flags of‭ ‬England and‭ ‬Scotland with St.‭ ‬Patrick's flag from‭ ‬Ireland.‭ ‬The upright red cross,‭ ‬St George's Cross,‭ ‬represents‭ ‬England.‭ ‬The blue background,‭ ‬on which St Andrew's Saltire‭ (‬in the shape of a white X‭) ‬appears,‭ ‬represents Scotland,‭ ‬while the diagonal red X which overlays the white X on the blue background of Scotland,‭ ‬is known as‭ "‬St Patrick's Cross‭" ‬and represents Ireland. The Constitution of the‭ ‬United States,‭ ‬for example,‭ ‬is the document which was drawn up in‭ ‬1787,‭ ‬together with the twenty-two amendments subsequently made to it.‭ ‬Most countries in Europe possess,‭ ‬or until recently have possessed,‭ ‬documents which set out in black and white most,‭ ‬if not all,‭ ‬of their constitutional law.‭ ‬It is true that most countries inevitably develop in the course of the practical working of government certain usages which are not in fact parts of the law in the ordinary sense,‭ ‬but which are found by experience to be indispensable for the smooth working of the Constitution,‭ ‬so that it is doubtful whether any mature Constitution can be said to be wholly written in a legal and authoritative sense. The relations between the House of Lords and the House of Commons,‭ ‬at least in certain respects,‭ ‬are laid down in the Parliament Acts of‭ ‬1911‭ ‬and‭ ‬1949.‭ ‬Numerous other examples can be quoted,‭ ‬and obviously our constitutional law is in part written in the statute-book. But by no means all,‭ ‬or even the greater part,‭ ‬of the law applied in the courts is to be found in Acts of Parliament.‭ ‬A very great deal of it is law not enacted by any legislature at all,‭ ‬but is the common law hammered out through the ages by the King's justices,‭ ‬which provides a source of law in decided cases.‭ ‬This common law consists of judicial decisions on actual cases decided in court,‭ ‬and is to be found written in the reports of proceedings in the courts. The very fact that all courts are bound by Acts of Parliament and must apply them is but a rule of common law‭; ‬there has never been any legislation ordering the King's justices to enforce statutes or Acts of Parliament.‭ ‬But they do so,‭ ‬and have always done so,‭ ‬or at any rate since a short period of doubt and difficulty in the earliest days of parliamentary enactment.‭ ‬Similarly,‭ ‬innumerable points of great importance to the preservation of the rights and liberties of the individual citizen,‭ ‬and of his remedies if aggrieved,‭ ‬exist only at common law,‭ ‬not by virtue of parliamentary enactments,‭ ‬which,‭ ‬especially in recent times,‭ ‬tend to curtail individual rights rather than to preserve or extend them. Furthermore,‭ ‬a great many of the rules and usages of the English Constitution are not legal in character,‭ ‬and are not to be found written in the statute-book nor in the reports of judicial decisions,‭ ‬nor written at all,‭ ‬except in the legally unauthoritative,‭ ‬purely academic expositions of scholars,‭ ‬lawyers,‭ ‬publicists,‭ ‬and the like.